As you can see, I have a little mess brewing on my desk. About two weeks worth of sticky notes, with ideas that popped into my head while walking around the house, driving my car…or lying in bed. 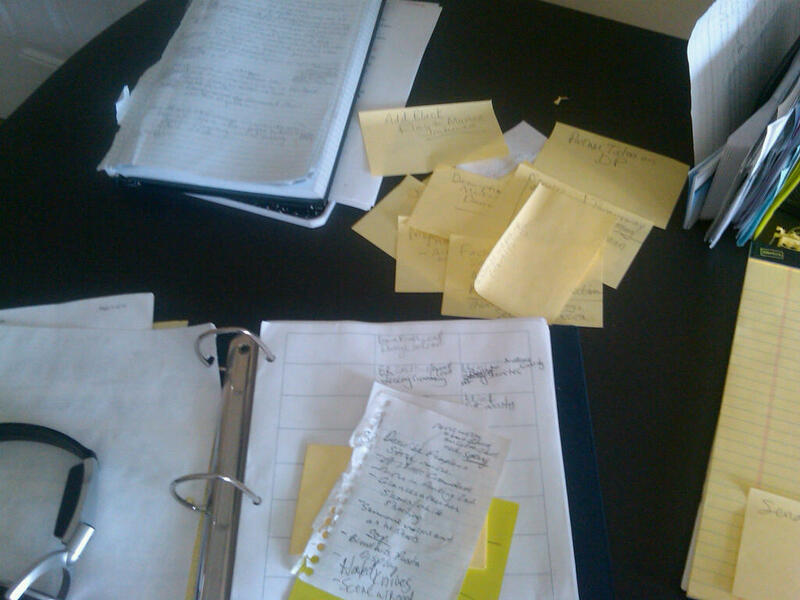 Most of these notes pertain to a specific scene I am writing, or have just written. Details I missed or changes I feel compelled to make. I gather these and then address each one in turn. I usually tackle a few per day, to keep the pile from growing, but you can see that this system isn’t working well. This is actually a good thing. I’ve been faithfully writing close to a thousand words early each morning, every day for the past three weeks, which is why the pile has grown. All of my time has been spent moving the story forward. Check out the word count at the top of the blog. Not bad. I’m shooting to wrap this thing up around 110K…I can hear Joe groaning. Now to eliminate the yellow mess. Just read the prologue to your new book, and can’t wait to read more.